Liberzon added that there are no head-to-head data to suggest that a single SSRI is better than another. “Other [available] SSRIs are likely equally efficacious,” he said. Although Khurana says that these medications have proved to be effective for treating PTSD, she added that she has seen a positive response among patients who were willing to try medication in tandem with therapy sessions. Although SSRIs are generally accepted as an effective form of treatment for PTSD, the extent of their efficacy as monotherapy has been questioned, and there is some detraction from the belief altogether. In recent years, investigators have explored options such as psilocybin and methylenedioxymethamphetamine to fill the gap in treatment. 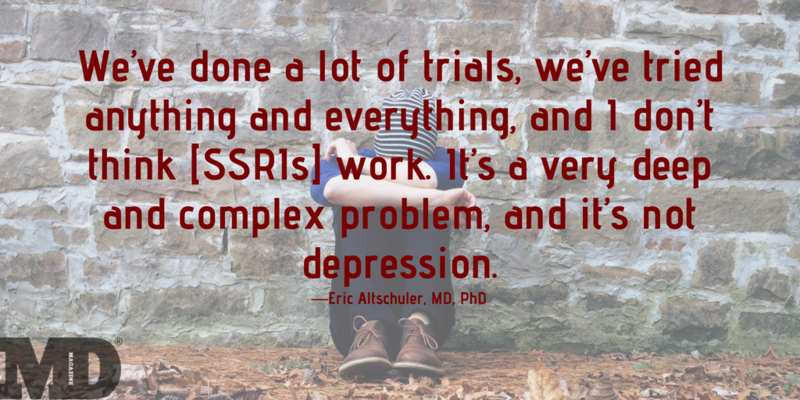 Altschuler, for one, postulated that SSRIs, especially alone, are not an efficacious healing method. Khurana stands by the efficacy of these medications used along with therapy, but even so, she is a proponent of eye movement desensitization and reprocessing therapy because it helps patients tap into and process emotions. Although research into other PTSD medications has been limited to this point, according to Liberzon, investigators have recently begun exploring several other agents, such as ketamine, cannabinoids, and agents targeting the glutamatergic or orexin system. The SPS&S procedure induced severe PTSD-like behaviors, with lower levels of brain-derived neurotrophic factor (BDNF) protein levels and higher levels of the hyperpolarization-activated cyclic nucleotide-gated channel 1 (HCN1) protein found in the prefrontal cortex. The results showed that these behaviors were reversed by a single 15-mg/kg dose of ketamine. After receiving the ketamine, the rats showed significantly increased locomotor behavior in the open field test, intensified exploratory behavior in the elevated plus maze test, and decreased immobility time spent in the forced swim test. Furthermore, the rats experienced an increase in BDNF protein levels, while the expression of HCN1 was down-regulated, according to the study. Results from another study, done with human subjects, published in March 2018 in Biochimica et Biophysica Acta by Basant et al showed that combined mindfulness psychotherapy and ketamine is effective in treating PTSD.4 The 20-patient study examined the length of sustained response with combined Trauma Interventions using Mindfulness-Based Extinction and Reconsolidation and ketamine. Previously, results from studies had identified a negative correlation between antidepressant response to ketamine and basal plasma concentrations of d-serine (DSR). The findings of Basant et al showed that the basal DSR levels positively correlated with the pretreatment severity of PTSD symptoms (Pearson r = 0.42; P = .07), and patients with basal DSR levels of ≥3.5 μM displayed not only higher PTSD severity but also shorter duration of response. These data indicate that basal DSR levels may serve as a biomarker for the severity of PTSD symptoms and as a predictor of clinical response, according to the authors, which could aid in the use of new therapies for the condition. The investigators found cannabinoids prevented the SRs-induced alterations in social recognition memory, locomotion, passive coping, anxiety-like behavior, anhedonia, fear retrieval, fear extinction, and startle response as well as a decrease in BDNF levels in the hippocampus and prefrontal cortex. Significant correlations were found between depressive-like behaviors and BDNF levels in the brain. The findings suggest that cannabinoids may prevent both depressive- and PTSD-like symptoms following exposure to severe stress and that alterations in BDNF levels in the brain’s fear circuit are involved in these effects, according to the study. Because these new agents for treating PTSD are currently being studied and are not yet approved, Liberzon refrained from commenting on their efficacy. “[There are] no newcomers that [have] been sufficiently studied and are approved,” he said. Decades-old, tried-and-true medications remain industry standards for the treatment of PTSD; however, the efficacy and acceptance of up-and-coming agents like ketamine and cannabinoids may add to the antiquated arsenal of available therapies. 1. Jeffreys M; US Department of Veteran’s Affairs. Clinician’s guide to medications for PTSD. www.ptsd.va.gov/professional/treatment/overview/clinicians-guide-to-medications-forptsd.asp. Updated April 17, 2018. Accessed May 23, 2018. 2. Altschuler EL. Animal-assisted therapy for post-traumatic stress disorder: lessons from “case reports” in media stories. Mil Med. 2018;183(1-2):11-13. doi: 10.1093/milmed/usx073. 3. Hou L, Qi Y, Sun H, et al. Applying ketamine to alleviate the PTSD-like effects by regulating the HCN1-related BDNF [published online March 27, 2018]. Prog Neuropsychopharmacol Biol Psychiatry. doi: 10.1016/j.pnpbp.2018.03.019. 4. Basant P, Ludmil M, Moaddell R, Wainer IW. d-Serine is a potential biomarker for clinical response intreatment of post-traumatic stress disorder using (R,S)-ketamine infusion and TIMBER psychotherapy: a pilot study. Biochimica et Biophysica Acta. 2018;1866(7):831-839. doi: 10.1016/j.bbapap.2018.03.006. 5. Burstein O, Shoshan N, Doron R, Akirav I. Cannabinoids prevent depressive-like symptoms and alterations in BDNF expression in a rat model of PTSD. Prog Neuropsychopharmacol Biol Psychiatry. 2018;84(pt A):129-139. doi: 10.1016/j.pnpbp.2018.01.026.